Discussion in 'Winter Camping' started by PERRO, Aug 31, 2016. Sosteve, actichy, woodsmanjohn and 12 others like this. These are outsatnding blankets. IMO they are warmer than sheep's wool and incredibly soft. Personally, I would wait to see if they have a Labor Day Sale or, if you can wait, for their big sale around Thanksgiving. However, if you wait, you may not get the size/color/blanket that you want. T. Pollock, Subdood, rsnurkle and 3 others like this. I just signed into my account there and checked my Thanksgiving order for the twin size ... it was originally the same price as listed above, then given a discount taking it down to $48.99. I know we wont know how mush the sale price this year will be, but that price above is outstanding for a warm azz blanket. That blanket stayed on our living room couch all last winter, everyone snuggled up in that thing and loved it! MichaelJ. and Harper like this. Another question. Are these blankets 100% alpaca? Sheep and I don’t play well together, even blends have had me blistering. Yes. Only alpaca is listed in materials. popedandy, Subdood, JAY and 1 other person like this. 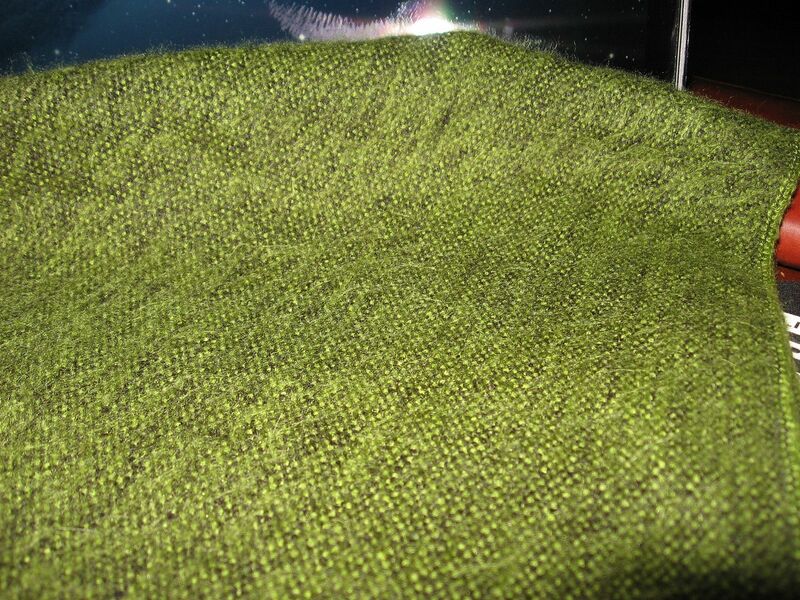 I've washed & air dried my "Light Weight, Green Alpaca Blanket", with no noticeable shrinkage ! Sosteve, Red Ochre, T. Pollock and 4 others like this. I just signed into my account there and checked my Thanksgiving order for the twin size ... it was the same price as listed above. I know we wont know how mush the sale price this year will be, but that price above is outstanding for a warm azz blanket. That blanket stayed on our living room couch all last winter, everyone snuggled up in that thing and loved it! I STAND CORRECTED .... After looking for a "care card" regarding washing instructions, I found my receipt from last year. The twin was originally the same price as listed above, then the discount was given on my receipt. The reduced sale price was $48.99 for the TWIN. Sorry for the confusion. I wanted to correct my statement as soon as I realized my error. rsnurkle and Harper like this. Mine is 55% Alpaca, 45% Merino (Sheep). I have heard that some people who are allergic to sheeps' wool used these without a problem--but everybody is different. They are also extremely soft, if that is the problem. 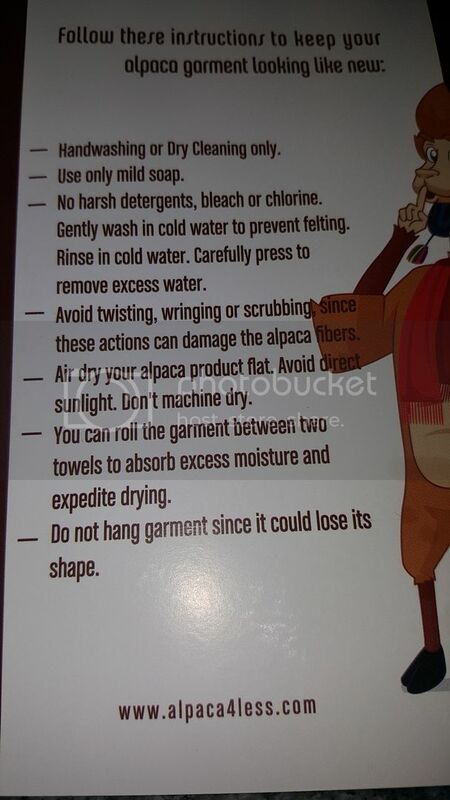 Edit: I contacted the merchant regarding the Alpaca content prior to ordering this blanket. This is the percentage that they told me. T. Pollock, rsnurkle, JAY and 2 others like this. Thanks, that was what they told me a couple of years ago when I contacted them; I was hoping they might have changed. Most of my skin is covered in winter, and my hands are tough enough that they can stand up to blends, but my face, especially where I shave, will look like I set myself on fire (and hurt just about as bad). T. Pollock, rsnurkle and Harper like this. Their throw-type blankets (thinner) were 75% Alpcaca/25% Merino (Sheep). These are also very warm and even softer. Turtle Creek and rsnurkle like this. Wifey swears to be allergic to Wool ( Sheep ) ..But, hasn't had any issues with my " Alpaca Wool Blends ". T. Pollock and Harper like this. Interesting, only alpaca is listed as the materials online. They need to fix that. My wife's hoodie I ordered for her is 100% and was listed the same way. I just checked the ones linked. Those should be 100% alpaca. The less expensive throws are listed as a blend but not the ones op linked. Turtle Creek and Harper like this. I agree. They should list the materials. The throw weight blankets actually cost more (for a comparable size) because of the greater Alpaca content. werewolf won, Turtle Creek and Vanitas like this. I contacted them on Facebook. I am going to guess that the 10% cotton comes from the outside trim on the blanket and the main portion of the blanket is made up of the Alpaca / wool blend. Red Ochre, werewolf won, Turtle Creek and 2 others like this. How much do the clothes/blankets shed? Is there a method of care that reduces shedding? Do you follow the "hand wash or dry clean only" instructions for laundering the clothes/blankets that is listed on the tag above? How delicate are these items? When she first got it the hoodie shed a lot. Then we washed it and it has been fine. She has only worn it a couple times as it has been very warm even at night up until now. Yeah I'd hand wash it... you can supposedly really stretch the garment out in the washing machine pretty badly. It seems fine for quality, but I wouldn't go walking through a bunch of thorns with it. Red Ochre, Turtle Creek, Harper and 1 other person like this. See that annoys me because in the description they put " This is a heavy blanket, not like the throw type." and "Material: Alpaca Wool" Not the blend like in the throw description. I'm going to send them an email since it is so misleading. It is definitely a heavy blanket--I'd say it is at least twice as thick as the throw-weight blanket. The banderitas are also definitely warmer than the throw blankets because of their increased thickness. They would be warmer still if they had a higher Alpaca content (it would probably cost a lot more too). This is a very solid blanket. Warmer than my HBC and way softer too. The throw-weight blankets are still very warm for their thickness. They, too, would be warmer still if they were 100% Alpaca. These blankets also pack down nice. By all means, contact them and ask them to be more forthcoming in their descriptions. I've bought a number of items from them now and have found them good to work with (shipping is a bit high). I don't think that they are being evasive on purpose. Just my take. T. Pollock, Turtle Creek and Vanitas like this. 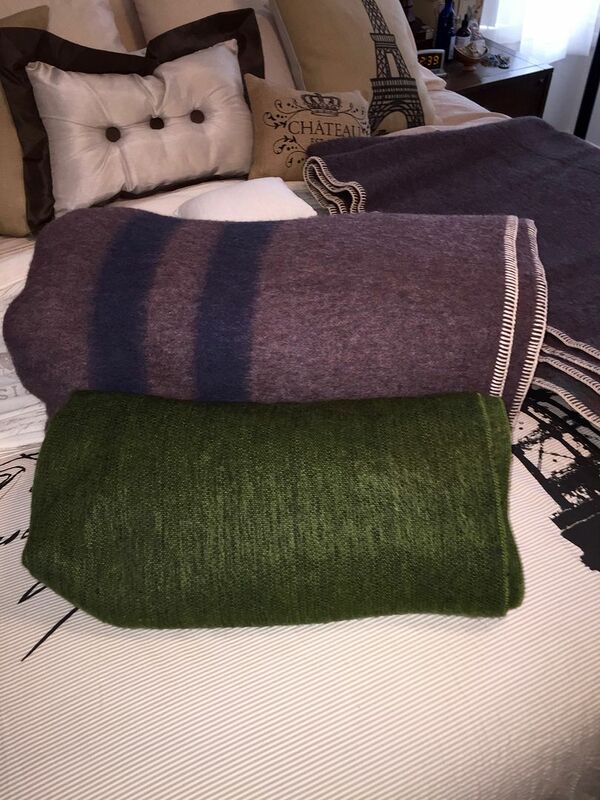 My Green Blankets are from a different vendor & they are " Light Weight " compared to my two " Heavy Military Queen Alpaca Blankets ", from Alpaca 4 Less. I haven't washed them ( Military Queen Alpaca Blanket ) , but have tossed them inside of the dryer w/Fabric Softner sheets, to freshen them up. I haven't had any major shedding of fibers, left inside of the Dryer lint collector. IMHO. They are toooo Heavy Weight for my washer..I'll take them to the " Dry Cleaner ", when the time comes. Turtle Creek, Vanitas, rsnurkle and 1 other person like this. My Banderita shed a lot the first season. I put it in the dryer on a no-heat, air dry cycle a couple of times. This seems to have helped. The shedding decreased over time. I haven't used it since last winter. It reminded me of a person who had a big dog in their house. The throw-weight blankets did shed some in the beginning, but not nearly as much as the Banderitas. Once they were broken in, they didn't shed much at all. I hand wash all my wool. I haven't needed to do that on these yet. I don't like Dry Cleaning. The throw-weight blankets seem delicate because they are thin. I'm told that they are quite strong and durable. I would still use a ground cloth or bivvy with them. I think that they are a great substitute or supplement for a top quilt. The Banderitas are much thicker and are more hardy IMO. @PERRO has had his blanket longer than me, so you might want to ask him. Turtle Creek, Vanitas and rsnurkle like this. I have the Twin size blanket & bought my wife the infinity scarf. They both shed, nothing too crazy. Hopefully this coming winter, the shedding will slow down. I don't have anything different to add than what Vanitas, Perro & Harper all said above. Having said that, I may buy a king size this Thanksgiving for the bedroom if the price is right. Vanitas, rsnurkle and Harper like this. I bought two " Italian Wool Blankets " a few years back.. They reeked of mothballs, so I hung them out in the garage for weeks & then tossed them in the Dryer.. They both shed a handful of fibers, & are thin compared my " Military Queen Alpaca Wool Blankets ". Crick, T. Pollock, Vanitas and 2 others like this. They have a 15% labor day discount right now, site wide. Turtle Creek and T. Pollock like this. 20 % Off SALE Entire Store. traveller, Ratdog and BigBubbaJ like this. I'm not impressed at all with the one I just got. My French Orange colored one is 2x as thick and MUCH heavier than the Queen sized Alpaca one I just got today on the 30% deal. You double the alpaca one over then it is the same thickness as the French one. This one is going to end up as a house blanket only. Did you get the military blanket? You might want to give it a try since you already have it. Alpaca is both lighter than sheeps' wool (a good thing) and warmer (another good thing)--it doesn't need to be as thick or heavy. I'm really liking my queen that i got. they sent me a 20 off email and i figured that was it, Then after i bought it the next day they sent me a 30.i got no response back when i questioned that tactic but i do like the blanket. a word to the wise is to wait for the very day.probably after xmas now. I just got a banderita twin and this thing is almost as soft as good fleece. My only question is how it will do when wet. I keep seeing it's warmer than wool but I've not seen anything about its performance when wet. On this and some other threads people have talked about shedding. As an update, I ran it through my dryer on no heat/fluff for half an hour and got minimal shedding off of it. I've attached a picture of what I got out of the lint trap. There are some other closeups of the fabric for those who are interested. geneaut, Ugly_Barbarian, Broke and 1 other person like this. Any more good deals on these coming up? Looking to grab one! They have a big sale around Thanksgiving. My wife who hates wool absolutely loves this blanket. Very warm and soft without the wool itch. These are excellent, they are the best blanket for the money i have seen, esp when they are on sale! I have two, one queen and one twin. Use them all winter! Why would you ever buy anything but the King size?